If you know me at all, you know I use my iPhone for literally everything. My iPhone is my main source of information for travel, hotel booking, gas prices, Toronto traffic and more. A few years ago, I started booking hotels using a variety of different apps. The biggest problem was that they were not in Canadian dollars and I often had to leave the app to use the calculator and figure out how much I would actually be paying per night. 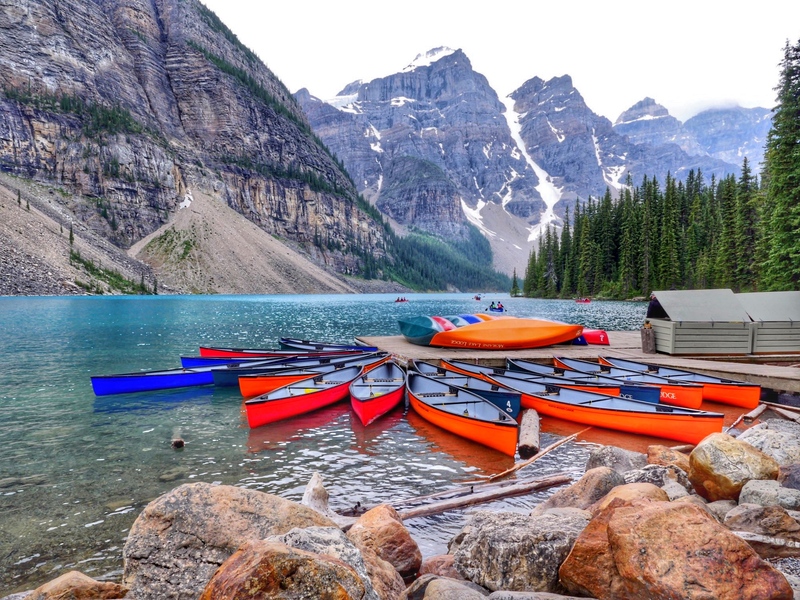 Recently, I learned that Booking.com was in Canada and decided to give it a try. 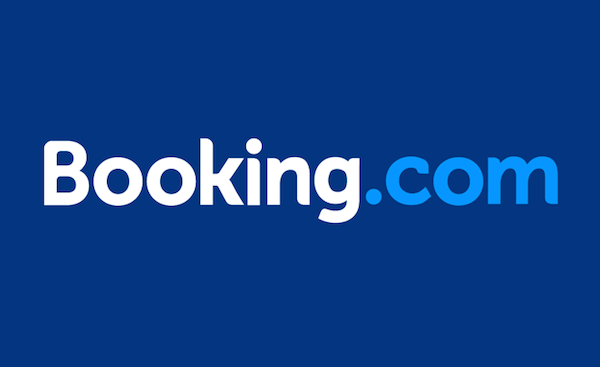 Booking.com has two booking apps. Booking.com and Booking Now. The difference depends on when you are looking to travel. Have a few weeks before your trip? Booking.com is the app to use. 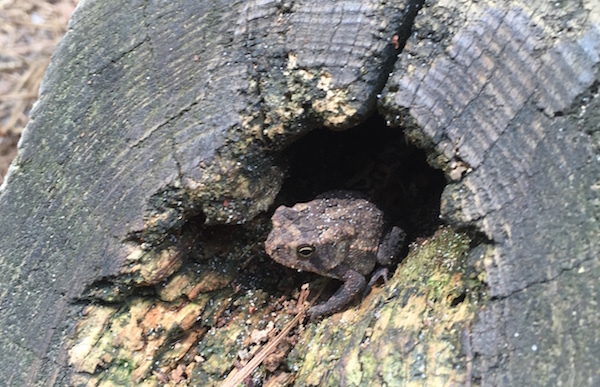 Looking to stay tonight? Booking Now is your best friend. As I took to the road this summer, I decided to try out both apps. The reason being that when I drive with the kids, I really don’t like to have to get somewhere in one day. Because I am the sole driver but even when I’m not, I like to eliminate the stress of getting to a specific hotel unless we plan on staying a few days. This is where both apps really came into play on our road trip. I knew we wanted to stay in Virginia Beach as its one of my favourite summer destinations. I knew I wanted to be close to the main Boardwalk and have access to a good pool. I also had no idea where we would stop on the way there or the way home. Using the Booking.Com app was really simple. Mostly because it was in Canadian dollars. This was of course a huge factor based on the exchange rate this summer. Every time my kids ate, I tried not to calculate the extra amount of money I was really paying for ice cream. I typed in Virginia Beach and had almost 100 hotels to choose from. I like choice but it was time to narrow these search results down a little. I loved that the options weren’t just “Price” and “Stars”. I find both of those filters don’t always lead to the hotel that is perfect for us. Instead, I searched by facilities particularly “Free Wifi”, “Family Rooms” and “Outdoor Pool”. I then filtered by review score. The reviews on Booking.Com are what makes the app and website worth its weight in gold. Once you have visited a property, you are asked to review it. The review is only filtered for personal details and profanities. The reviews tend to be very accurate to the traveler’s experience. I knew what to expect when we arrived at our Booking.Com choice, the Holiday Inn & Suites North Beach Hotel based on the 200 reviews posted for the property. It was rated 8.4/10 and I was able to pick it out from the long line of hotels based on the accuracy of the photos on the site. I pulled in and was immediately greeted by the friendly valet parking team. I knew the service was free from prior reviews and with a huge smile on my face I handed over my keys and headed inside. The check-in area was clean and the staff were ready with a smile. I always get nervous when booking with any app but the check-in process was flawless. The hotel had my keys ready and within 20 minutes of pulling in, I was pulling a lounge chair into the sun while my kids jumped right into one of the 3 hotel pools. What I liked most about using the Booking.Com app is that I was able to prepare myself for some of the hotels flaws. I knew in advance the elevators weren’t great so I was able to request a room near the stairs which we prefer to use for exercise when traveling. I also knew that the wifi wasn’t the greatest, so I downloaded magazines and shows on my iPad before arriving. The reviews of the hotel on the Booking.com app were exact to what this hotel is; a great option for families in an amazing location. We were literally steps from the beach and a minute walk away from the famous Neptune statue and a great playground. Because we were on the North End of the beach we were also incredibly close to First Landing State Park. We woke up early in the morning and after a quick 5 minute drive set off on one of our greatest hikes of the summer. We saw cottonmouth snakes, explored the marshes and had a great day in the park. 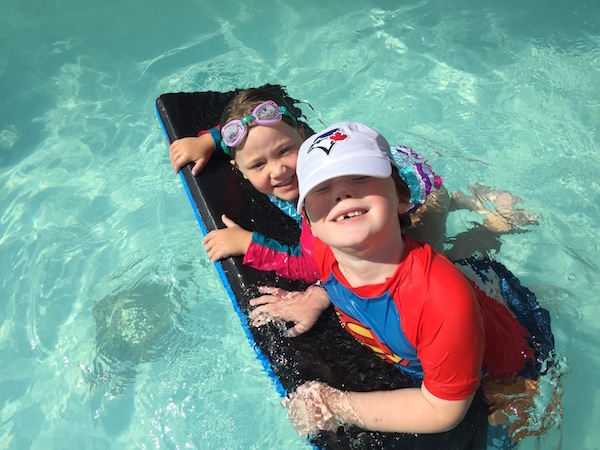 After that we returned to the hotel for some by the pool fun where the kids entered contests at the pool including a cannonball contest and I chatted with a few other Canadians we met in the water. 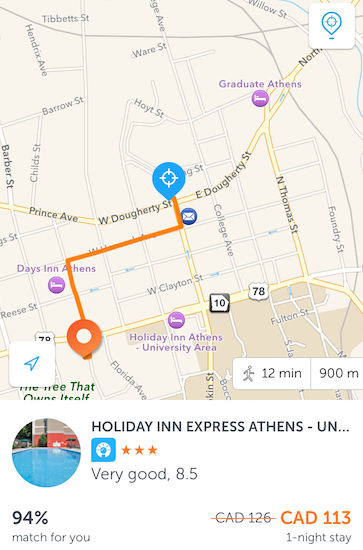 The Booking.com app led us to exactly the type of hotel we wanted to be at and we will continue to rely on it and the Booking.com reviews to guide us in the future. 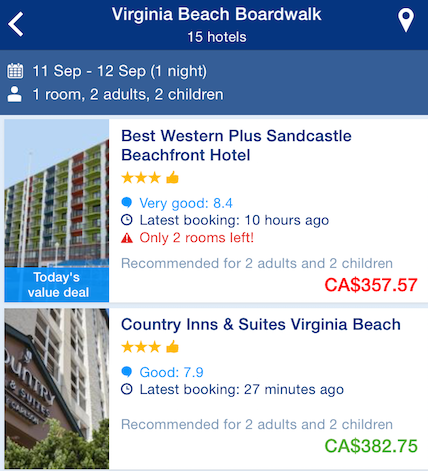 On our way home from our road trip, I decided to try the Booking Now app for comparison sake. I had no idea how far we would get in a day as we tried to get as close to Windsor, Canada as possible from Aiken, South Carolina. It turns out we had a fantastic travel day (trust me we’ve had some bad ones), and got all the way to Athens, Ohio before deciding it was time for dinner and a swim. When you download the Booking Now app, there are a few getting to know you questions. These include your general price range, how many guests you travel with and your must haves. For must haves you can choose from things like wifi, breakfast and non-smoking hotels. The app immediately finds your location and gives you the nearest and best options that match your profile. An issue I had was that the app is that it is much more for a business or personal traveler without kids. When you choose who you travel with, you only have the choice of alone or with someone else. The features for must haves are very much adult based and there are no options like kids clubs or pools. That being said I loved playing with the app. It’s sort of like Tinder for hotels. The app shows you a range of hotels with a percentage match rate for you, the current price, location on map and the newest reviews. The reviews are a score out of 10 and the positives and negatives of the hotel. I often now use it in Toronto to see if we can score a great price for an adult night on the town. As for Athens, Georgia, I pulled off the road and immediately opened the app. The app told me there was a Holiday Inn Express 900 meters away that was a 94% match for me and had a very good 8.5 rating. The image for the hotel on the app was a pool. Although my preferences said I was only traveling with another adult, the app told me that the hotel room would hold a maximum of 4 guests so I knew we would be fine. The room was clean and huge and perfect for our needs. We ate dinner, hit the pool and were able to rest up for the remainder of our drive the next day. The cost of the hotel was around $113 Canadian. All and all, I am pleased to welcome Booking.com to Canada and will follow up these experiences with more as I use the apps on the road. Both are incredibly easy to use and led to two great hotels for our needs. Give it a try and let me know what you think.